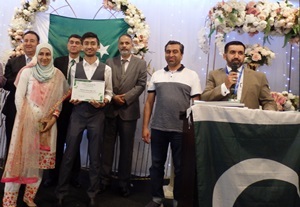 The Australian Pakistani community-based in Sydney Celebrated the 79th National Day of Pakistan with traditional fervour and resolve to make Pakistan a strong, vibrant, progressive and democratic welfare state. 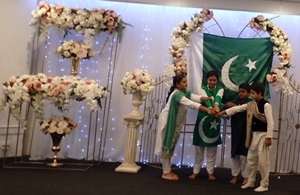 The Pakistan Day event was arranged by Pakistan Association of Australia. This Event was held on Sunday, 24th March 2019 at the Himalaya Emporium, Bankstown Sydney. The High Commissioner H.E. 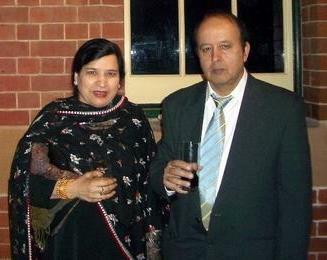 Mr. Babar Amin was Chief Guest who travels specially from Canberra to Sydney. Consul General of Pakistan in Sydney Mr Abdul Majid Yousfani, Consul of Pakistan Consulate Bushra Salam, Former CG Azam Mohammed, President Pakistan Australia Business Council Mr Iftikhar Rana and large number of Pakistani community members attended the ceremony expressing their love for Pakistan. During the Celebrations of Pakistan day, PAA Lifetime Achievement award announced to Leading Psychiatrist Dr Ishrat Ali who is ill and people prayed for his better health with full recovery. Kids perform on stage by ; Shafaq Maheen, Muhammad Ayaan, Muhammad bin Hasham, Amarina Khawja, Zunaira Zar Imran and Utbah Ali Imran. The Hon. Shaoquett Moselmane Congratulated the Pakistani community living in the Australia and recalled the challenges confronted by Pakistan since its inception and how the country faced challenges through national resolve, resilience and commitment by the Pakistani nation. He appreciated positive Role of Australian Pakistani Community and said that I always feels proud to participated in the National events of Pakistan. The President Pakistan Association of Australia Mr Abbas Rana said that on this day, the Muslims of the subcontinent resolved to achieve a separate homeland in order to lead their lives with dignity, honour and freedom. He added that the unity and maturity displayed by Pakistan during the recent unprovoked air violations committed against Pakistan by the Indian forces was a reflection of the unwavering belief the Pakistani people have in their country and its institutions. President PAA paid homage to the Martyrs of New Zealand terrorist attack; condemned the heinous act; expressed solidarity with the government and people of New Zealand; and sympathised with the bereaved families. Mr Abbas Rana lauded the bravery of the armed forces of Pakistan in responding to the Indian act of aggression. On the behalf of the Community, Pakistan Association Presented a Gift of Thanks to Pakistan Army which was received by the Advisor of Pak High Commission Canberra Brig Asim Khan. In his address, the High Commissioner His Excellency Mr. Babar Amin congratulated Pakistani community on the occasion. HC Babar Amin said I also congratulates Pakistan Association of Australia for arranging this event in Sydney for celebrating Pakistan Day. He said the National Day of Pakistan was celebrated every year on the March 23 to commemorate the achievement of the Muslims of Sub-Continent who passed the historic “Pakistan Resolution” on this day at Lahore in 1940 which culminated in the creation of Pakistan after seven years. High Commissioner Babar Amin said Pakistan has suffered heavily from the menace of terrorism. Pakistan condemns terrorism in all its forms and manifestations. We lost valuable lives of our citizens in the terrorist attack in Christchurch. The people and Government of Pakistan have expressed solidarity with the people and Government of New Zealand, the bereaved families and appreciated the humane compassion and respect displayed towards the Muslims in the aftermath. We also thank the Australian people who reached out to the Muslims providing succour in anxiety and pain caused by this horrific act of terrorism. High Commissioner Mr. Babar Amin also paid tribute to the Pakistan defence forces for proving their mettle and courage in defending their motherland. H.E. Mr. Babar Amin said the new elected government in Pakistan has a focus upon the overseas Pakistanis. He mentioned the different steps towards welfare of Pakistani Citizen settled in the other countries. H.E. Babar Amin said the most sustaining link between Pakistan and Australia is provided by the Pakistan Diaspora here. I am happy to say that our community has been positively contributing to the development of Australia through its integrative initiatives and hard work which makes us all very proud. With the reference of history, the High Commissioner Babar Amin said it was the community from areas now in Pakistan that had in 1860s and onwards helped open Australia’s outback by laying telegraphic and railway lines. People to people contacts, educational links with over 13,000 Pakistani students in Australia, and our common passion for cricket bring us even closer.